Three months until I hike the AT. I can almost taste it. I see the White Mountains in my mind’s eye, the impossibly fresh water springs straight out of Mother Earth’s belly, the buggy summer nights sparkling with fireflies and green – green, green everywhere. I fall in love with the people I haven’t met yet, lighten my pack with each delicious snack break, stop on a rock overlooking sights I can’t even imagine yet, and write to you about it. Two birds land on my tailgate as I write this, then fly away. The red dirt of my desert home is covered in small white flowers, small like Cliffroses, but dwarfed by the environment. By that I mean both that they remain small because of lack of water, but also appear small within the vastness of the land. Straight ahead, Bear Mountain sits, a sprawled Jaba the Hutt of a mountain. Oh, but I know its other side, its steep side. I climb it on that side for training. I usually only make it to its second plateau, then sit in contemplation. 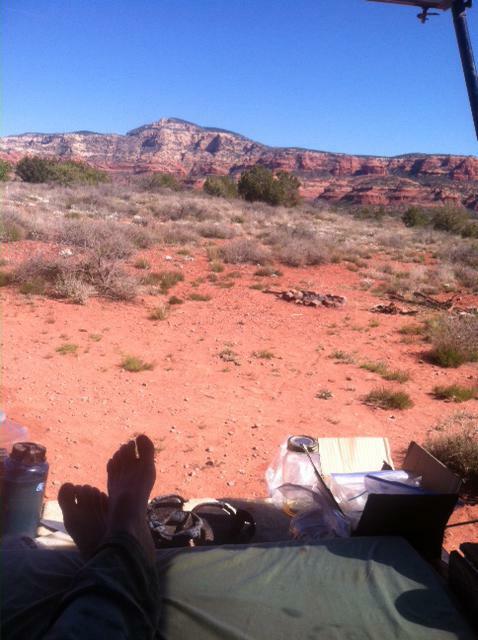 I am a hybrid creature, part thru-hiker, part Sedona wildling. Half anchored here by the beauty of the prickly pear flowers and the delight of finding a tarantula underfoot, half away, imagining the eastern roots and rocks soon to meet my shoes. I am bilocating. Always here and there simultaneously. I wonder if when I will be there, I will also still be here. And if I am, will it still count as being in the Here and Now? 3 months until the AT. Funding is uncertain, resolve unwavering. I will be at Kathadin the first week of July regardless of circumstances. If Grandma Gatewood can hike with nothing, then so can I. If Miles and I can survive on $6 a day in a foreign country, then I can live large on a trail. If $10,000 appeared out of nowhere to finance my PCT hike, and I have since learned to live comfortably well below normal means, why wouldn’t the Universe continue to provide? Benny says there will be Grand Canyon trips for me until I leave. I am launching a new campaign for Crazy Free at the end of April and have invested some funds into Amazon advertising. With a delay of three months between sales and royalty checks, whatever move I make now determines how well I will eat then. So in a way, my Here and Now and that future There and Then are intricately linked. Like an acorn and oak, this one there pulls me forward, that one here grows to become it. Those of you who owe me money, hold on to it in case I need it later. Those of you to whom I owe money, whatever you gave me will be given back to you ten-fold by the Universe. Everyone else, stay tuned! I am curious how this will play out. I have learned to appreciate (even expect) the last-minute theatrics that have guided my life and funded my adventures so far. Next … On the Roaming Bobcat. This entry was posted in 2016, AT, written in sedona by the Roaming Bobcat. Bookmark the permalink.